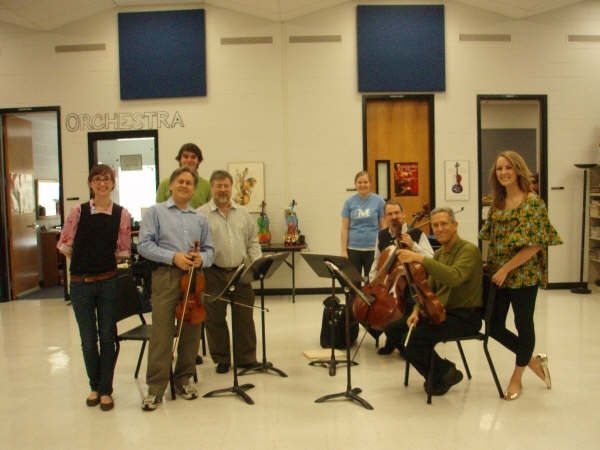 On Monday, February 18, 2008, the Orion String Quartet presented two educational outreach concerts for the San Antonio Chamber Music Society. In the morning they played at MacArthur High School for the varsity orchestra, music theory students, band members, and theater students. In the afternoon they played at O’Connor for varsity orchestra students. At dinner the evening before these concerts, I briefed quartet members about the format and asked them to allow time for Q&A. We all rolled our eyes and agreed the questions would inevitably fall into the category of quantification – “How much did your violin cost? How long have you played?” etc. Well, we were wrong. The quartet was impressed and amazed by the sophistication of the students and their questions. One young violist asked “How do you listen for balance when you are preoccupied with your own sound under your own ear?” A tuba player asked “How do you focus on inner pulse as a group?” Someone asked how long it takes the quartet to learn a piece. Todd answered that they don’t like to perform anything without having at least 3 or 4 three-hour rehearsals. Steve told of counting the hours they had practiced a particular Schubert Quartet before performance – 60 hours! And ultimately, their answer was “20 years and counting.” We never stop learning. 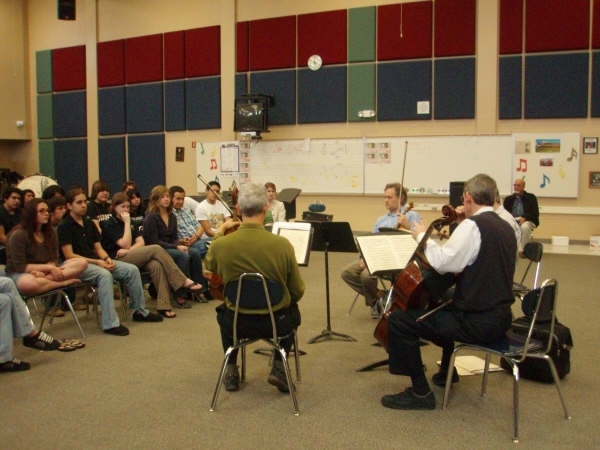 One of the teachers asked the quartet to give advice to music students considering studying music in college. Without skipping a beat, Steve spoke up saying “it’s a lot of hard work.” And then Danny chimed in advising that if one is thinking of majoring in music in college to see if he/she likes it, then do something else instead and save music for an avocation. In a moment of levity, a budding violinist asked Danny if there was any history behind his style of socks. I had already noticed his penchant for sartorial eccentricity in the socks category at the concert on Sunday, when I saw he was wearing socks with fish on them. On Monday he wore colorfully striped socks. He told a story about how someone had once written a review of a concert where he was concertmaster. The poor reviewer was so distracted during the entire concert trying to figure out why this young man was wearing such odd socks, that the concert was ruined for him. And to this day, Todd has amazing taste in socks. Vive la Difference!! Jan and I played Nascar drivers all day trying to keep the quartet on schedule. Joe Romo met us at Silo’s on 1604 for lunch and then attended the afternoon concert. Afterwards we managed to whisk the musicians to the airport in time for Danny’s 4 o’clock flight. It was a fabulous and inspiring day. I hope more board members will be able to attend an educational outreach concert next season. Incidentally, the Orion Quartet specifically asked that we hold the events in orchestra rehearsal rooms rather than auditoriums. They really wanted to be up close and personal in their presentation. I am increasingly confident that reaching out to one school at a time and establishing an intimate teaching and role model situation is of great value in our community.